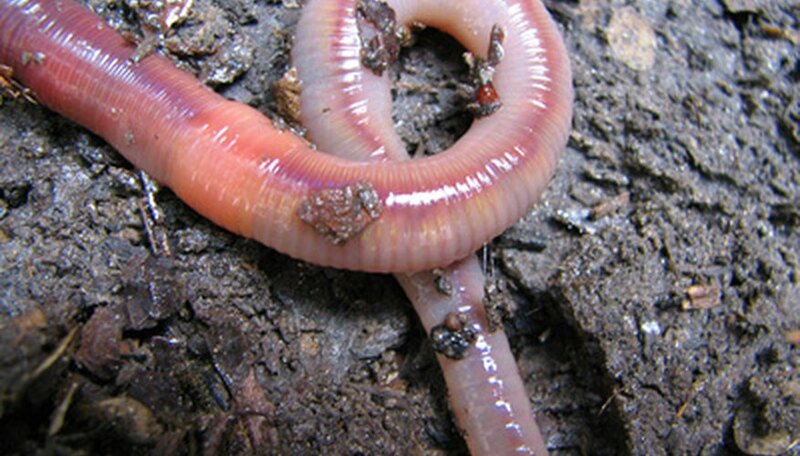 There are over 7000 species of earthworms in the world, according to U.S. Department of Agriculture. Worms play an important role in your vegetable garden. They help break down organic matter and aerate the soil. The water in the soil is also increased when worms are present. Worms are a sign that your soil is healthy for your plants to grow in. One way to utilize worms to benefit your vegetable garden is to try vermicomposting, or worm composting. Get a plastic bin with drain holes in the bottom just big enough so that liquid to drain into a tray underneath. It should also have a cover that keeps the contents moist while still allowing air flow. Fill it with moistened shredded newspaper or peat moss and then add your worms. Red wigglers are best for this purpose. Use kitchen scraps such as egg shells and fruit and vegetable scraps, but no animal products. Break them up small and put them on top of the worm bedding. The worms will eat the scraps and create "castings" or worm droppings. This is like black gold for your garden. You can learn all the details of vermicomposting by visiting the University of Nebraska Extension Office through the link in the resources below. If you want to attract earthworms to your vegetable garden, you need to enhance your soil by working in compost that you have purchased or made yourself. If your soil is heavy clay, work in some peat moss to aerate the soil. Once the soil has been worked well at least six inches deep, cover it with mulch to keep the soil cool and moist. An organic mulch is best because it will gradually decompose and add more organic matter to the soil. Mulch will also protect the soil from being packed down, making it easier for worms to work their way in. Plant your garden as usual. You may see worms moving in soon after. Continue to amend your soil each year and you will soon have a thriving worm population as well as a thriving vegetable garden. You can purchase worms for your vermicompost bin from many garden supply catalogs. However, if you do not have soil that supports them properly, your purchased worms may find more suitable soil or just die off. Amended soil will attract worms when it offers the type of environment that worms need to live in. For the money invested in amendments, you will have a plentiful supply of earthworms, superior soil and thriving vegetables. According to Ecological Agricultural Projects of Canada, worms mix and till soil, improve the structure of the soil making it easier for plant roots to penetrate, help with the formation of humus and increase the availability of nutrients to plants. Worms help to break down any organic matter on the surface of the soil and affect the movement of water through it. Areas with no earthworms present typically have dry, cracked, lifeless soil. Dead leaves or other organic matter accumulate on the surface and break down very slowly, making nutrients unavailable to soil organisms or plants. Proper soil management is important to healthy, productive vegetables as well as to a healthy local population of earthworms. The use of chemical pesticides and herbicides can be detrimental to the worms in your garden and to other organisms important to soil health. Use organic gardening methods whenever possible. Soil is not just inert material; it is a living ecosystem. If you take care if it as such, you will be rewarded for your efforts with a more bountiful garden.